Welcome to Your Legal Guide! If you are faced with a legal issue, you need trustworthy information so that you can quickly locate a qualified lawyer and learn what to expect  both from your lawyer and from the legal system. Your Legal Guide is an online law publication that provides easy-to-grasp information on areas of law that affect ordinary people every day. Our comprehensive guide also includes an abundance of tips on choosing an attorney. Each section provides background information as well as articles touching on aspects of the law, and hiring a lawyer, that you need to know to understand your rights and protect yourself. Your Legal Guide is not intended to replace the advice of a qualified attorney. To obtain legal advice, you will need to contact a lawyer who specializes in the area of law specific to your case. Once you have read up on the legal topics that interest you, you may choose to visit our directory of lawyers. Before paying for legal assistance, you should meet with a lawyer in person. Make sure he or she has experience in the area of law that pertains to your case. Your attorney should give you personalized attention and take the time to listen to the details of your situation, as well as your needs and concerns. Our mission at Your Legal Guide is to help provide you with the information you need to choose a lawyer who can serve your needs. Laws vary from state to state, so it is important that you find a lawyer who understands the laws where you live and work. 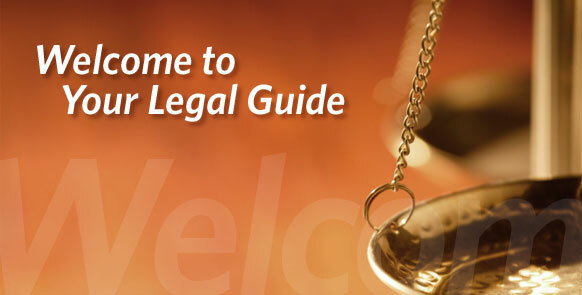 Thank you for visiting Your Legal Guide, an independent resource for legal information.